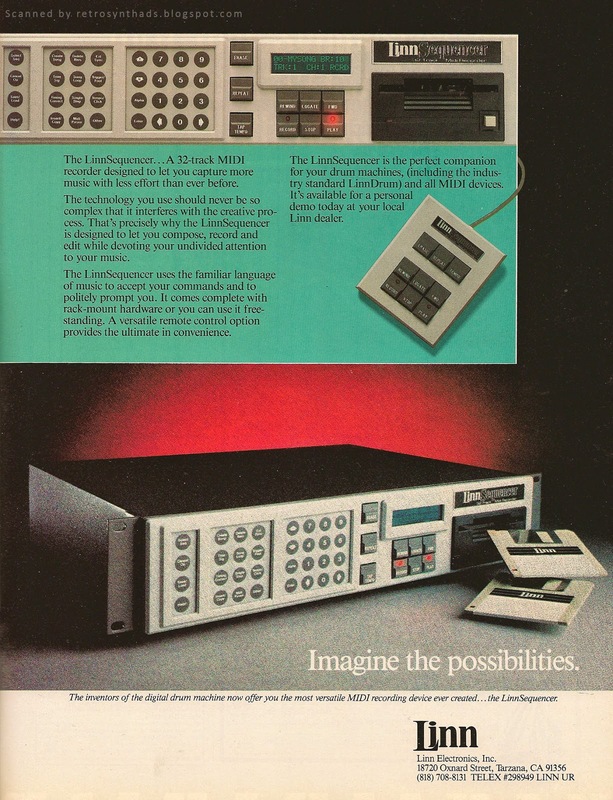 Linn Electronics LinnSequencer "Imagine the possibilities" colour advertisement from page 67 in the December 1985 issue of Keyboard Magazine. The actual design of the two ads are quite similar, with the same black background, the left-side pull-in callout box (yellow of the Midistudio, aqua for the LinnSequencer) and bottom white branding bar with the Linn logo to the far right. The similarities in design don't end with the ads themselves either. For one thing, the two units share a new rack mount design that is quite a departure from Linn's earlier desktop designs. They also share the same beige colouring and control-type buttons. "It is the brain of the famous Linn 9000, going back way before the MPC was invented. Apparently, only the MPC 3000 (maybe the 4000) has similar feel." More evidence can be found right on the front panel of the two machines. Many of the same sequencer buttons and controls (including some of the characteristic layout) can be found on both the Linn 9000 and LinnSequencer. And, well, it just makes sense that Roger Linn would take the renowned sequencer out of the Linn drum machines and sell its on its own.I just wished there was promo information from the time period that would spell it out. Unlike the LinnDrum Midistudio, the LinnSequencer must have made it into production since there are many good photos of the machine floating around the Web as well as a few up for auction on eBay every now and then (including right now). For some really good shots of the front and back, I'd checkout this November 2010 auction post on MATRIXSYNTH. The mid-80s was an interesting time for hardware sequencers as two factors started coming into play. First, MIDI had begun to make major in-roads since its launch three or four years earlier. And second, home computers were dropping in price, including the new crazy-affordable Atari 520/1040STs. And with those home computers came software sequencers. Those Atari computers even came with built-in MIDI interfaces. Sweet. Although I couldn't find an original price for the LinnSequencer online, it turns out that this advertisement appeared in the same January 1986 "Midimania" issue of Keyboard Magazine that also included a great little chart comparing all the software and hardware sequencers of the time period. Jackpot. Looking at the chart, computer software sequencers were outnumbering hardware sequencers at least three to one. And compared to other hardware sequencers around at the time, the LinnSequencer was definitely on the more expensive side listing out at $1,250. The only hardware sequencer priced higher was Yamaha's beast of a sequencer QX1 at $2,795. A few others floated just under the LinnSequencer's list price including the Roland MSQ-700 at $1,195 and Roland MC500 at $1,095. The rest of the hardware sequencers ran somewhere in the range of $400-750. These prices could have made the LinnSequencer a tough sell. And believe it or not - it seems you can still buy of these babies. Forat, who still sells many updated Linn products including the LinnSequencer, has a page with some great technical and operational information. Definitely check that Forat page out. Linn Electronics LinnDrum Midistudio "Put a complete studio in your lap." colour advertisement from page 19 in the February 1986 issue of Keyboard Magazine. Here's a good question... What does the Akai MPC series of sampler/sequencers and the Atari ST have in common? In reality - not much. But in my mind - well... quite the opposite. 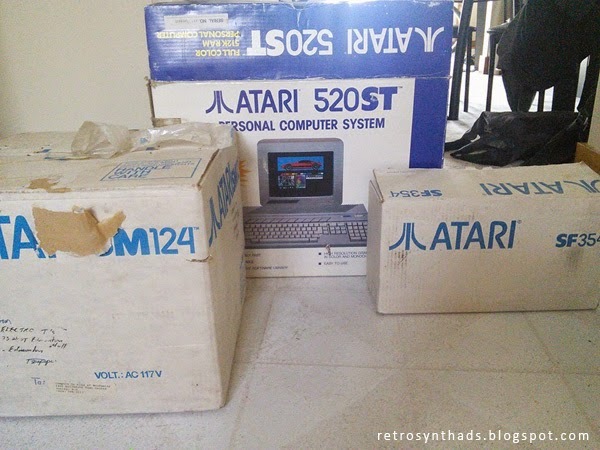 I've been infatuated with both for the last couple of weeks after a chance encounter landed a MPC 2000xl and an early model Atari 520 ST (in the original boxes - see photo at right ---->) in my possession. The MPC was in rough shape, in need of seven or eight new buttons, a new rotary encoder and variation slider (soldering isn't my strong suit), as well as about 10 or 12 screws that had gone missing after years of use/abuse. A quick search online for parts brought up MPCstuff.com - and I not only ordered the parts I needed, but also got a memory upgrade AND some thick black pads. Gonna totally hotrod that thing. As you may have guessed by the title of this blog post, those Atari software ad scans will have to wait because while I was digging through old Keyboard magazines for software ads, I came across this Linn Electronics ad for the almost-totally-unknown LinnDrum Midistudio. What a great looking machine. You could almost mistake it for one of Akai's new MPC controllers! Like, seriously! 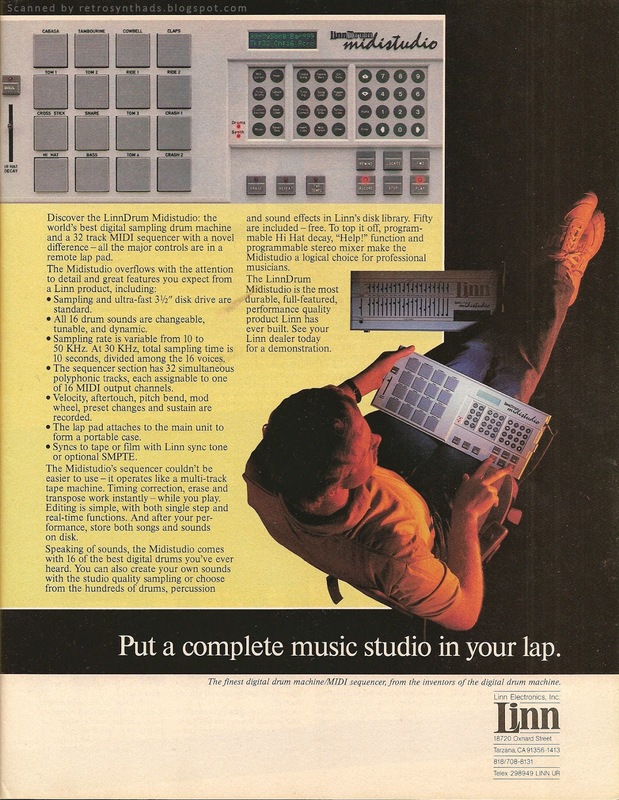 The LinnDrum Midistudio was the last product of Linn Electronics Inc. to be advertised in Keyboard Magazine, appearing in the February and March 1986 issues. And it looks like it was scheduled to appear in the April issue as well since it is referenced on page 140 of the magazine in the advertising index, but when you flip to its referenced position on page 87 of the magazine, it has been replaced by one of Keyboard Magazine's own ads for their "Rock Keyboard" book. Wait... what? Linn 9000? That was the last product by Linn Electronics? Not the Midistudio? Roger Linn's own museum page doesn't even mention the Midistudio. Turns out that many sources on the Web, such as Vintage Synth Explorer, consider the Linn 9000 to be the last product by Linn Electronics and that machine is also referred to as the "original MPC60". And let's face it - it kinda was. Because it was actually a machine you could buy. But, according to the few LinnDrum Midistudio sources available on the Web, including an April 2008 post by MusicThing, the actual direct descendent to the MPC60 was the LinnDrum Midistudio - although it apparently never made it into production (see blogger comments below that MusicThing post for a sighting of an actual unit in a music store). According to the page, the Midistudio was announced at the 1986 NAMM show as the replacement for the Linn9000. As you can see from the photo, it included the now-famous 4x4 pad configuration whereas the Linn 9000 had a more traditional drum machine-style long rows of drum pads. The Midistudio also featured that beige colour that became another trademark design feature of the MPC series.That post also includes one of the best photos of both the control unit and the actual rack unit, attached together by a 100ft cord between the two! Hence the the name of the ad: "Put a complete studio in your lap". And your lap could be all the way across the studio. "NOTE: Mail addressed to the old Linn address is being forwarded to Roger Linn personally. During the recent NAMM show in Chicago I spoke with Roger Linn and he is now working with Akai. He is working on a new product, which he would not divulge what it would be, my suspicions would lead me to believe this new product to be a spin off of the Midi Studio." Synthony.com has a page on the Midistudio as well, and explains its relation to the Linn 9000. According to the page, "all the 9000 features are retained including dynamic buttons, cue tempo, repeat, interchangeable sounds, 32 tracks per sequence and more." The page also gives us a list price for the Midistudio - $5,990.00. So, was the Midistudio the direct descendent to the MPC range, that then continued on to evolve into my broken down MPC2000xl and beyond? I'm gonna say yes, even if it never made it into production. The 4x4 pads, the beige colouring, and the few references I've found online is good enough evidence to me. And what happened to my MPC2000xl? Well, I managed to fix the buttons,install the RAM and make the pad upgrade - easy stuff. Chickened out on the soldering though. 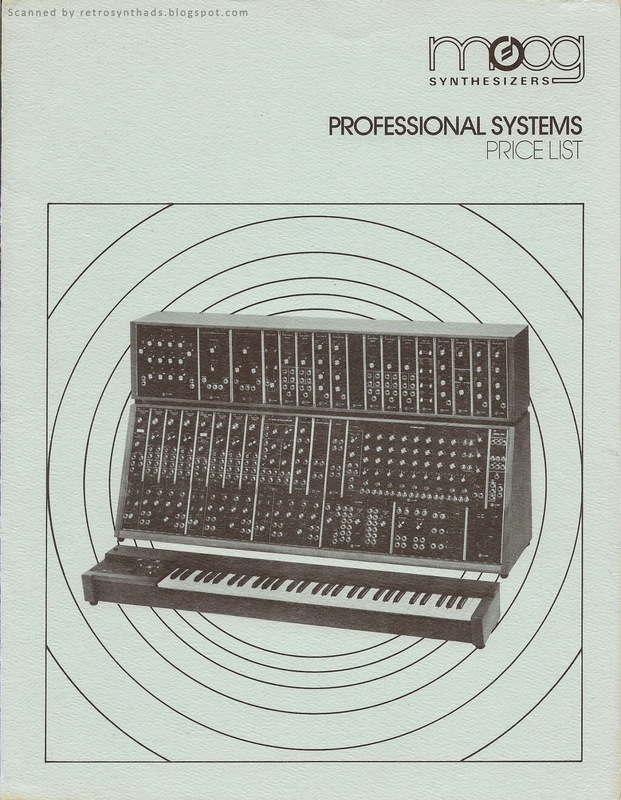 Moog Professional Systems Price List from March 1, 1976. 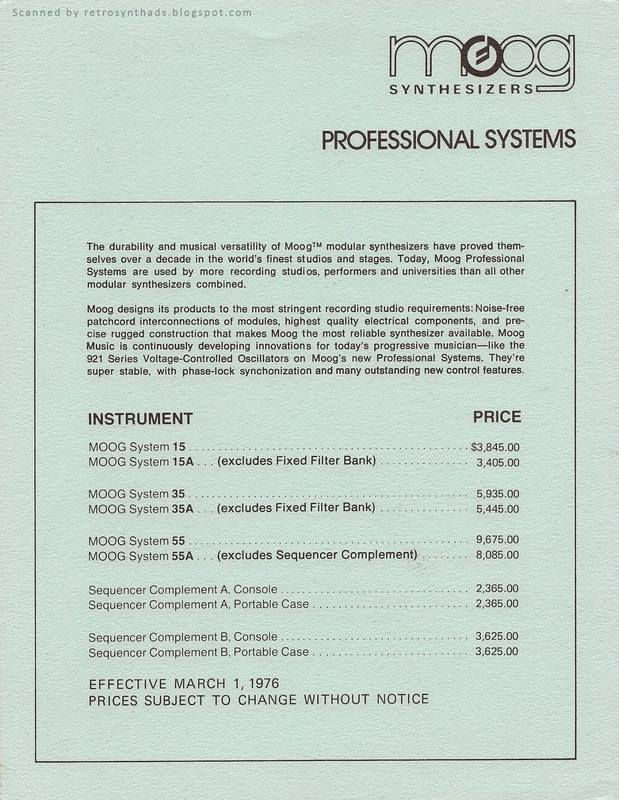 When friend of the blog Micke posted those links to the Moog 1972 and 1974 modular price lists in the comments section of my Moog Synthesizer 35 post, I immediately recognized the 1974 price list as looking eerily similar to a 1976 price list I had on my shelves somewhere. I went over to the Moog section and after a bit of digging finally found this little gem - in great condition too. Nice thick paper. Dark print. Yum. When I did a cursory comparison, they looked identical (except for the colour), but as I took a closer look the differences started to make themselves clear. 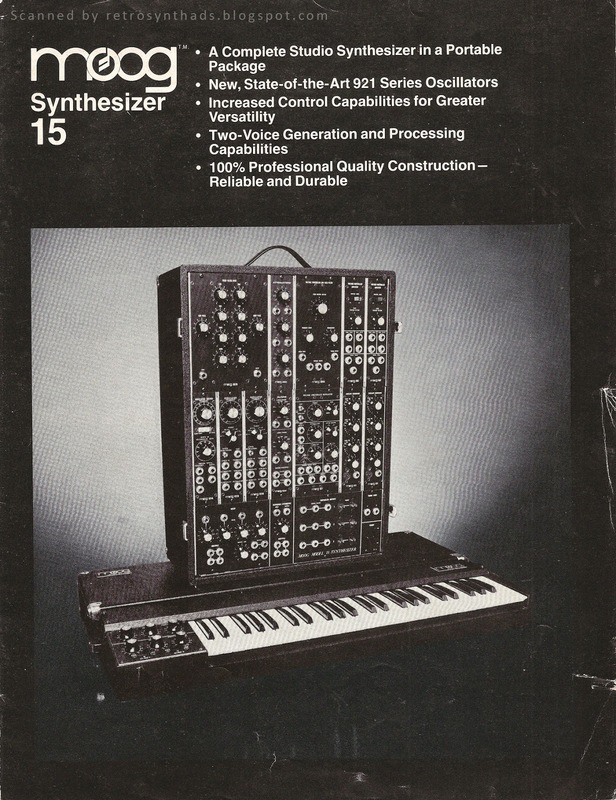 The cover of the 1974 price list and this 1976 price list are pretty much identical, except that the "TM" is missing from the Moog logo that sits in the top right corner - and in fact, its missing from every corner of every page. The design of concentric circles matches the design style used for their product reference sheets from the same time period. Flip open the list to the inside pages and again - very similar. On the inside-left page, the two paragraphs in the 1974 price list and this 1976 list are identical. No words have been changed. Underneath is the Instrument price lists, and its a little surprising to see just how much prices have gone *UP* in just two years. And remember, those differences are in 1976-dollars. That was a lot of cash back then! 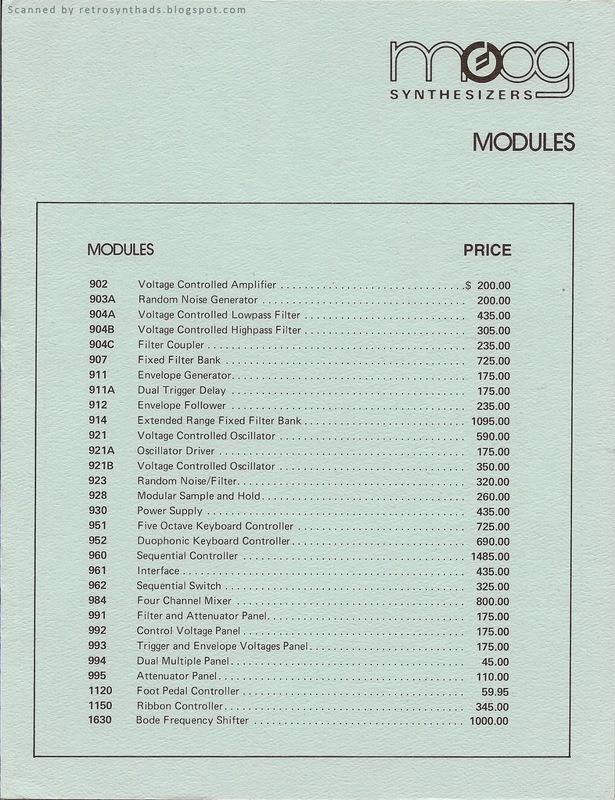 On the inside-right page of the 1974 price list and the 1976 list are modules prices. Again, we see the uptick in pricing in 1976, and we also are surprised with the availability of a few more modules! 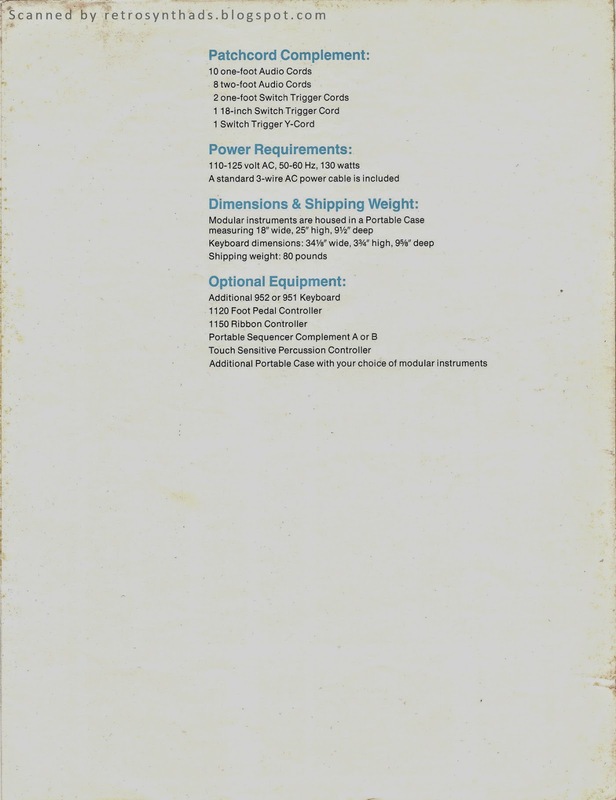 Finally on the back of the the 1974 price list and the 1976 list are images of the three different models available and a few selling points for each. Again, all similar between the two. The most interest difference between these two price lists is right at the bottom of the back page. On the 1974 list is written "Distributed by: NORLIN MUSIC Inc." along with some contact info. This is rather surprising considering that according to the "Bob Moog: A Timeline" page on the Moog Music Web site, Norlin Music purchased Moog Music Inc. from Bill Waytena in 1973, essentially making Moog a sub-brand. But, by 1976, Norlin finally decided to take advantage of their ownership status and up'd the tagline on that 1976 price list to "Another Quality Product from Norlin". And just to make it official, slapped that Norlin logo right next to it. 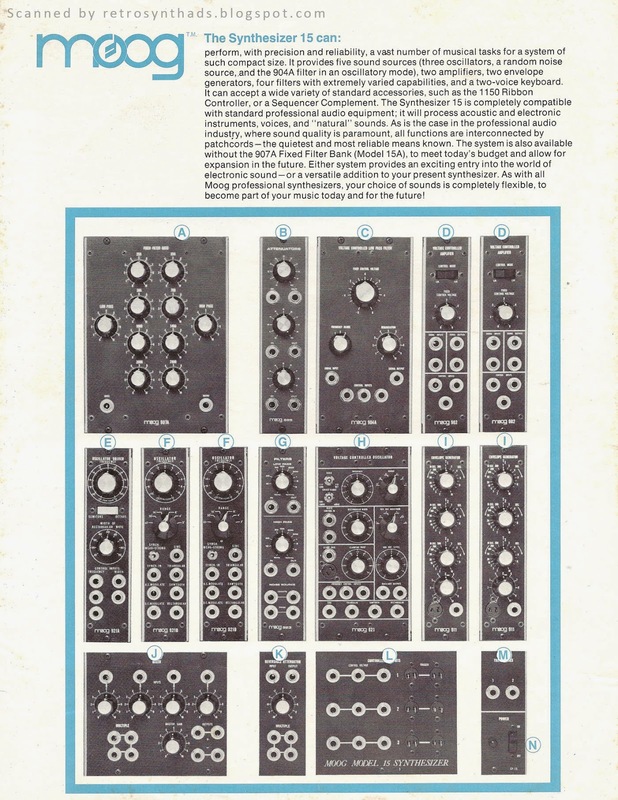 Moog Synthesizer 15 modular system six-page brochure from 1974. Ooooh... Aaaah... There we go. I feel so much better now. I need order in my life. Whether its aligning my cutlery on a restaurant table just so or posting a particular series of synth brochures in a particular order. It drives me batty until its finished. 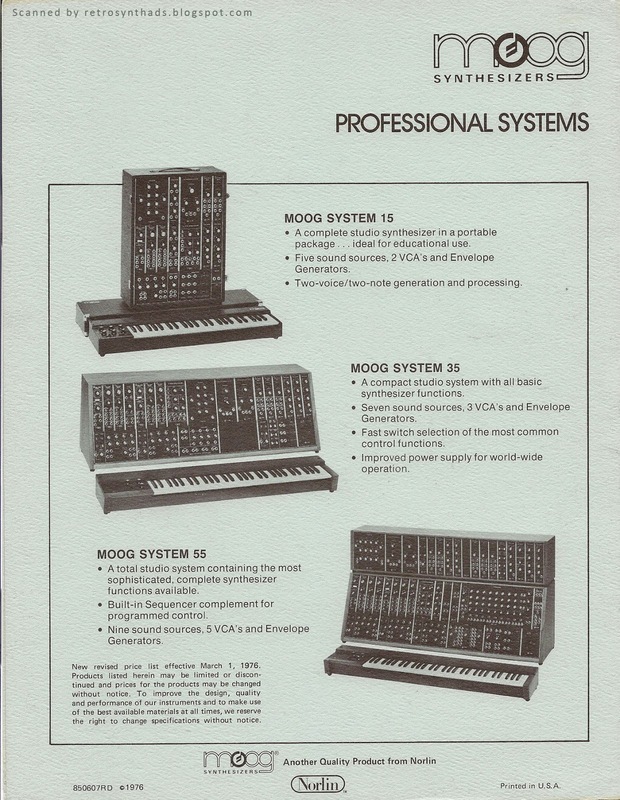 In this case, it was finally getting to post the third Moog Modular brochure in the 55/35/15 series. You have to admit - they do look rather nice all lined up like that. There are a few noticeable differences between the brochure for the Synthesizer 15 when compared to the others. First, as I pointed in my last blog post for the Moog Synthesizer 35, is the accent colour - this time a lovely baby blue. 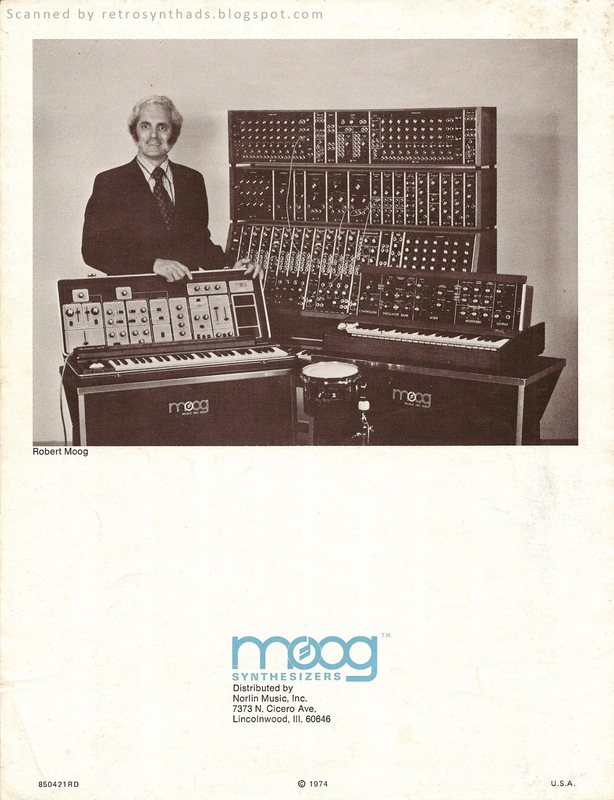 I do rather like seeing that Moog logo in the inner-centre page pop so nicely on the page. Next, and this also drive me a little batty, is that Moog decided to change the third subheading a little bit. 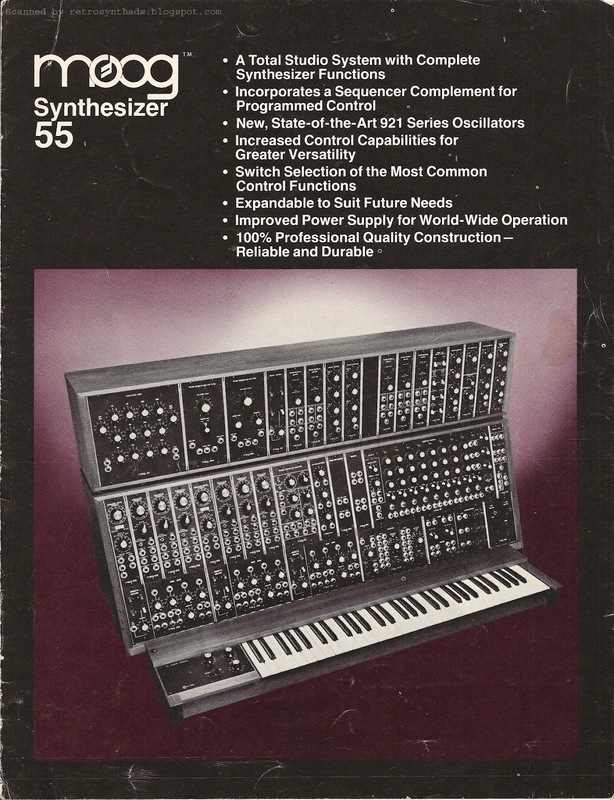 The first two subheadings on the inner pages are consistent among all three brochures, But in this Moog 15 brochure, the third subheading reads "The Synthesizer 15 can:", while the Moog 55 and 35 brochures read "The Synthesizer 55/35 will:". Gah. 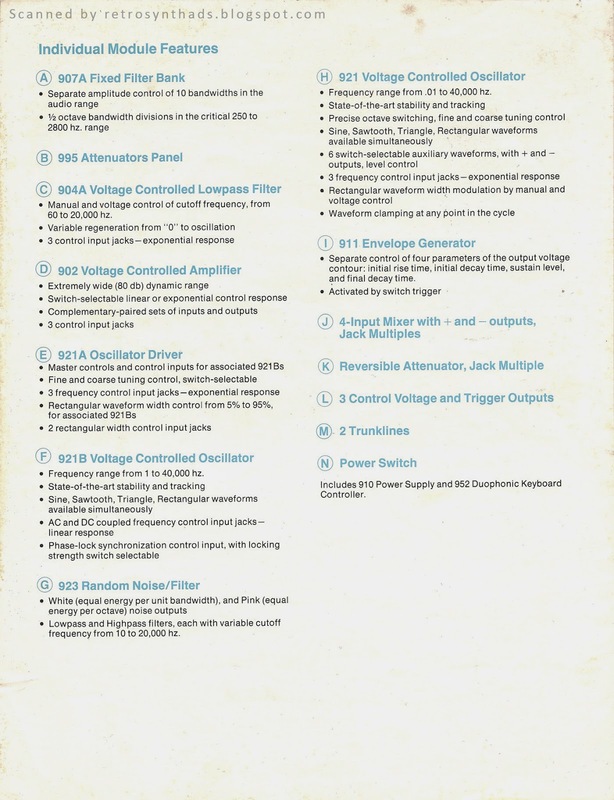 But, I gotta say, one difference I do like is the "Moog Model 15 Synthesizer" label that can be found on the bottom of the control voltage and trigger output panel. 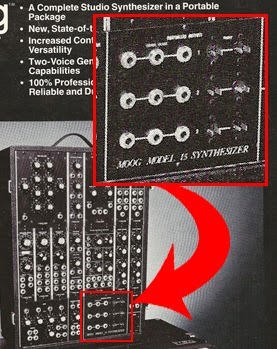 That label isn't found on the 55 or 35, and I've always thought the one thing missing from these Moog Modulars is some kind of model brand/identity. Of course, every module contains a lovely little Moog logo - a tradition that has remained with most, if not all modular synth manufacturers since. And I also get that the modular nature of these instruments means that model numbers mean very little when so much customization can be done. A Moog 35 can quickly blend into something that more resembles a Moog 55 with the addition of a few modules. Just as I was finishing up this blog post early Sunday morning, wise friend of the blog Micke dropped by last weeks post to leave a comment on the print/availability dates of the brochures. The print date for this brochure, like the others in the series is 1974. 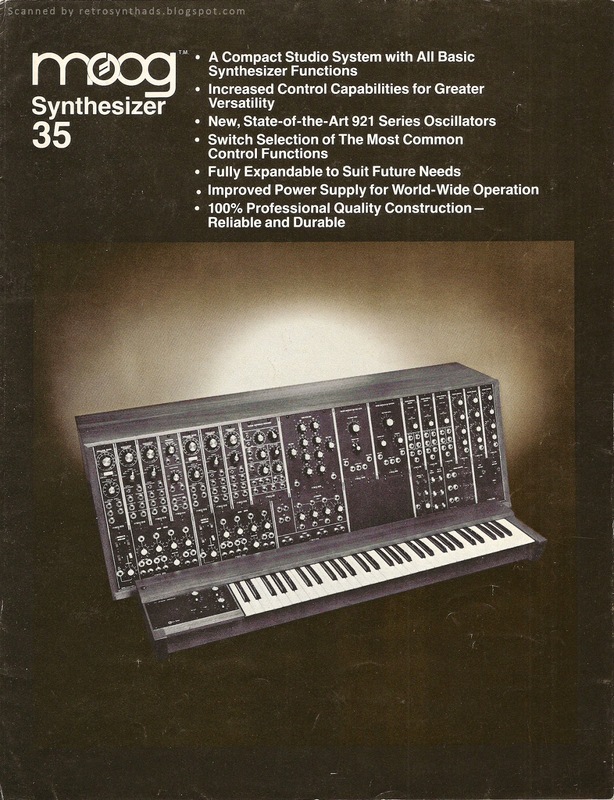 But I posed the question that since the 921 oscillators were referenced as "new" in this brochure, I thought there was a chance that there had been an earlier printing since those oscillators actually became available around 1972. 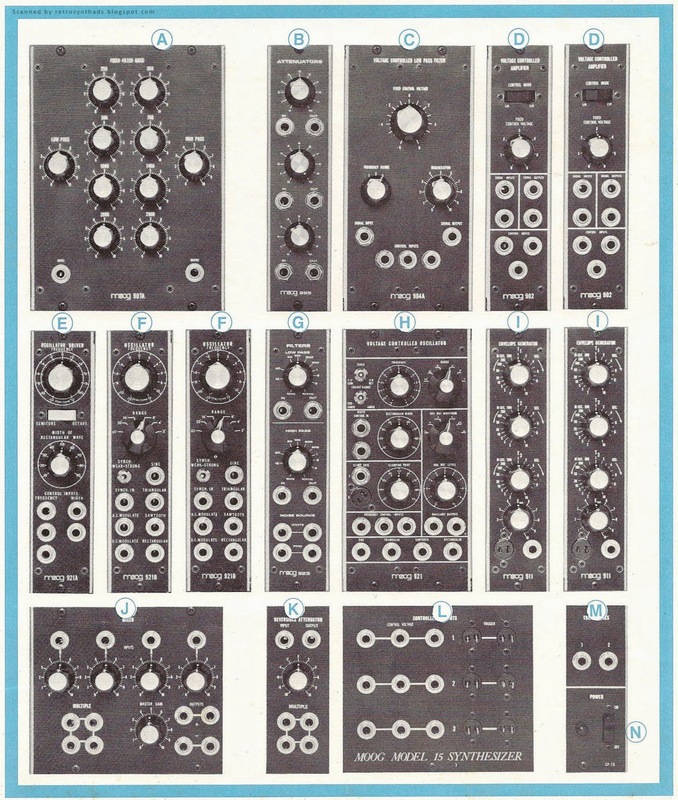 "To the best of my knowledge the Moog systems 15/35/55 were all introduced in early 1974 and therefore I'm pretty sure this is the original version of the brochure. 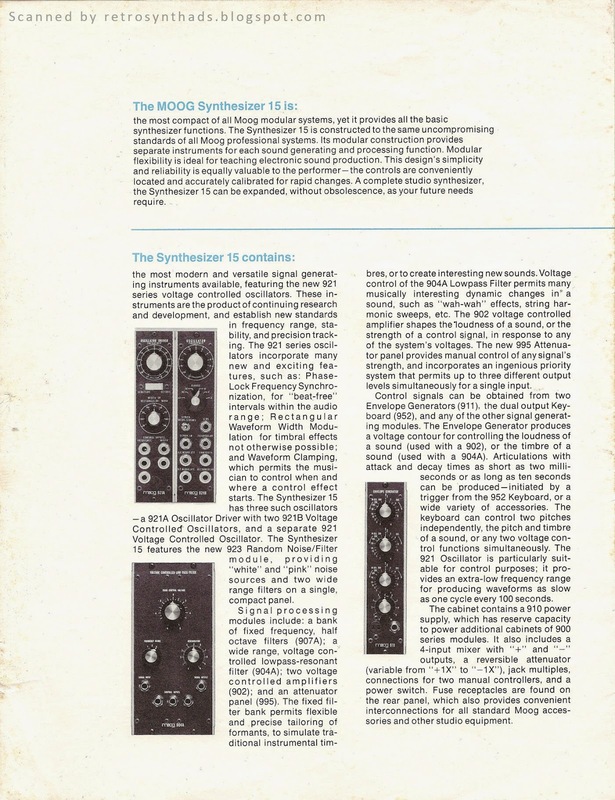 It is correct however that the 921 series oscillators became available in '72. The Moog 12 (with the new 921s) appears to have been released this year as well. I seriously doubt that the system 15/35/55 became available as early as '72 though. The fact that the older systems are still being listed in this price list from late '72 should be proof enough that the 15/35/55 didn't exist yet.